Minecraft, the ultra popular game, which has sold more than 14 million copies on PC and over 35 million copies across all platforms has also received tons of awards. Some of the prestigious awards include five awards from the 2011 Game Developers Conference: it was awarded the Innovation Award, Best Downloadable Game Award, and the Best Debut Game Award from the Game Developers Choice Awards; and the Audience Award, as well as the Seumas McNally Grand Prize, from the Independent Games Festival in 2011. In 2012, Minecraft was awarded a Golden Joystick Award in the category Best Downloadable Game. Now that everyone is raving about Minecraft and you’ve joined the bandwagon – you’re ready to get started. Now what? You’re surrounded by blocks and you’ve heard something about breaking those blocks and punching pigs, but what else is there? A lot, as you’ll find out fairly quickly. While the Minecraft game is super entertaining, you will have no clue when the creepers, skeletons, spiders, spiders with skeletons on their backs, zombies and a whole bunch of other bad guys begin coming out at night and you will have no clue when they do come. If you want to do well in this game – or even just survive your first night – you need to know how the game is played and devise a good strategy. Minecraft is a lot more than just breaking blocks and punching pigs. Minecraft Secrets Strategy guide will show you the fastest strategy secrets to getting started by mining and crafting the tools, weapons and shelters you’ll need to survive your first night, but will also tell you how to do well beyond that. This guide does a lot more than just teach you how to survive – it teaches you how to THRIVE. 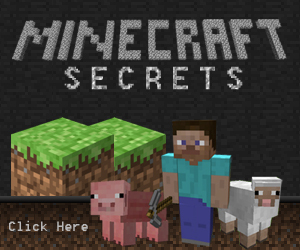 Minecraft Secrets is the kind of comprehensive overview that should be purchased with the game itself. Feedback from forums and social media feedback has led to this book. Split into several easy to understand sections and packed with 48 pages of information and screenshots, this is a “must own” guide for any beginner starting out in Minecraft looking to get the absolute most out of this awesome game!